Will you be attending Pack Expo next week in Las Vegas? If so, we’d like the opportunity to buy you a cup of coffee. All the new trends excite us – particularly drone technology being used to deliver packages. But we also like to focus on the fundamental things – like the fact that our third generation owed family business cares about your business. 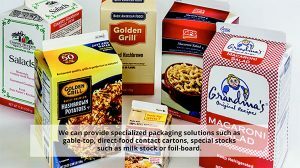 We will be emphasizing that we’ve been producing folding cartons since 1926. Our 90 plus years of experience may be very helpful on your next project since there are few box configurations and design challenges that we haven’t seen. Our Creative Service Team just won a Gold Ink Award for their work. And our specialty focus – gable-top cartons will be something we can demo at the NiMCO booth if you happen to stop by. We really would like to hear what is on your mind. Give Scott Garverick a call at 614.361.3036 if we can meet or you can email him at sgarverick@cartonservice.com. We will enjoy the conversation!